1) The material that the stencil is made from. 2) The thickness of the stencil itself. 3) The edge distance that the stencil offers. This feature is also known as "overall height". I’ll say more, later. I've seen parking lot stencils being advertised as "made from quality"...and then there's this fancy word for cardboard. I've also seen them made from "counter top" material. A) It's strong, unlike cardboard. It's more flexible, unlike counter top material. B) It’s also too easy to clean. Spray the stencil. You'll have a bit of "over spray" on the stencil itself. Let it dry. THEN...bend the flexible, LDPE and the dried over spray pops off. OR...you can peel it off and it looks like a giant potato chip. Now your stencil is "like new again". If you spray a cardboard stencil, the over spray soaks in. You cannot clean it easily and then hope to re-use it for years to come. If you spray a stencil made from some type of counter top material...two things may occur. 1) It's too rigid to bend. If you do try to bend it...be ready for it to break. 2) If the counter top material is rough, instead of smooth, the over spray will grip it tightly and won't let go = you cannot clean it...back to "like new again". After a while the over spray will build up and effect the quality of your work. Bottom line…buy LDPE. It's more flexible than HDPE. It'll lay to the contour of your parking lot. It'll last. It's too easy to clean...etc...etc. I've seen 10 Mil thicknesses and 30 Mil thicknesses. I've seen 60 Mil and 125 Mil. 10 Mil is about (3) pieces of paper, thick. So...30 Mil is about (10) pieces of paper, thick. There are a few things to consider, here. 2) When the actual paint hits the stencil, be prepared for the stencil to "flutter" and / or simply move. It's not heavy enough to do the work. Also, these aren't heavy enough to lay completely flat. If they're "wavy" at all...again...they do not possess the weight needed to simply lay flat. Paint will spray under the areas that are above the pavement and affect the quality of your work. 3) If you have to slide a "thin" material stencil out from under another stencil...the small "bridges" that hold the letters or symbols to the surrounding plastic...will eventually snag onto something and tear. This makes for more trouble. Be careful. The best (2) thicknesses are 60 Mil and 125 Mil. 60 Mil parking lot stencils are for occasional use. Schools that stripe or paint their own stencils can use these. A part time parking lot striping company or the maintenance department of a shopping center or hospital...will find that these are fine. Just take care of them. 125 Mil is for the professional parking lot striping company. Let the over spray dry. Peel it off. The bridges are tough. This thickness will last...seemingly forever. NEXT...Parking Lot Stencil "Edge Distance". This feature is also known as "overall height". Here's what that means; Let's say the stencil is a NO PARKING stencil with 12" tall letters. Let's say the "overall height" is advertised as 16". That means there's only 2" of plastic above the top of the lettering...and...2" of plastic below the bottom of the lettering. Again...2" edge distance on top + 12" lettering + another 2" edge distance on the bottom = a 16" overall height. I like an 18" overall height. Here’s why...it's not just about over spray protection...it's about strength. 1) If you're not too confident about spraying the stencil...a 2" edge distance is scary. A 3" edge distance isn't as scary. On a 12" NO PARKING stencil the overall height would be 18"...not 16". There would be 3” of edge distance above the 12” lettering and 3” of edge distance below the 12” lettering. Again, the overall height would then be 18”. 2) If you want these to last any amount of time...a 3" edge distance offers much more strength than only having a 2" edge distance. 1) Look for Low Density Polyethylene Plastic = LDPE. ; long lasting, easy to clean and easy to handle. 2) Buy 60 Mil or 125 Mil...you decide; occasional use or professional use. 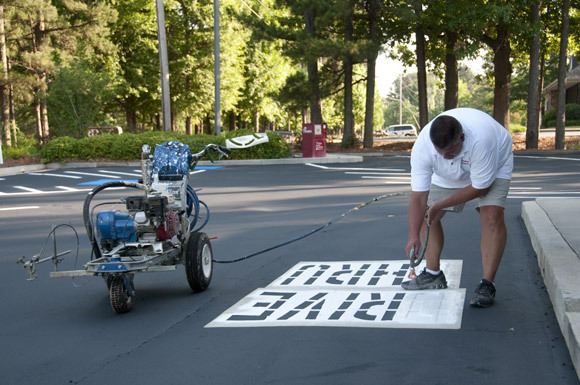 3) Make sure the edge distance is at lease 3" on standard, 12" lettering and even more on larger parking lot stencils. Ask for the overall dimensions.